Novelty Cane Art has been making furniture since 1987. 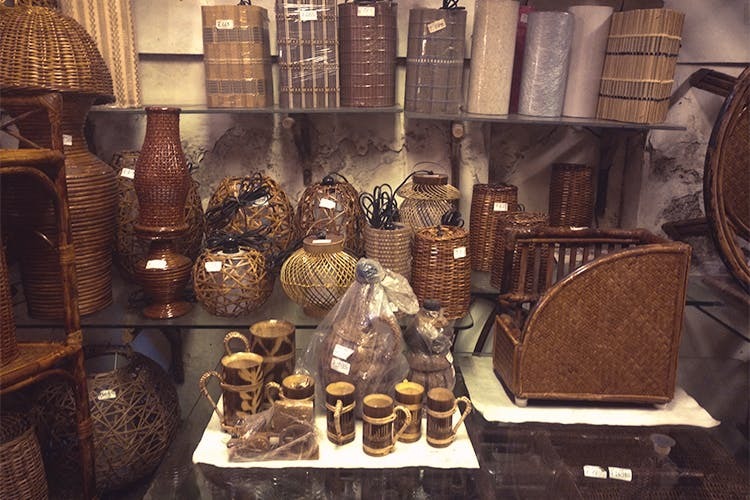 Started in Juhu, the shop moved to Andheri 27 years ago, with a workshop near the store, where they manufacture their own items with cane imported from Assam and Karnataka. What I discovered after entering the store only added to my surprise. A family business, now taken care of by Mr. Qadeer and his sons, Arif, Hafiz and Asif, this space has sprouted to become much more than a furniture shop. It’s an artist’s workshop, with each item holding its own ground. Novelty Cane Art specialises mainly in furniture, home décor, and artifacts. Everything you can think of while doing up your home is available here, that too in top-notch quality, at affordable prices. Cane chairs starting INR 2,700 upwards not only provides an earthy touch to your living room, but pair it with the table (INR 2,500) and you can ditch a sofa set. If you want an upgrade, you can go for their rocking chair (INR 4,700) or a writing table (INR 5,500). They also have a dining table set (INR 15,700), a five-seater sofa set with a table (INR 16,500), single beds (INR 9,000 onwards), cane wardrobe (INR 16,000) and cane swings (INR 42,00 upwards). Their home décor section is as impressive as their furniture. From full-length mirror frames starting at INR 2,650 to lamps starting at INR 445, they have everything you will need. Look out for their bamboo curtains (INR 125 per square feet), bamboo glasses (INR 300), bamboo mats (INR 650 for a set), kitchen basket (INR 2,000), laundry baskets (INR 1,450) and shoe racks (INR 1295 onwards). They also have other amazing items like side tables, magazine racks, bamboo trays, corner rack with lamp, bar chair, patio furniture etc. Their cane craftsmanship isn’t just limited to décor and furniture. Anything and everything you can imagine can be made to order at this shop. Cane wall art, false ceiling, bamboo huts, a tree vase, outdoor mediation nets, custom-made weave panels are some of the many brilliant artworks that I got to witness. They even designed a bamboo skirt for a popular fashion week. The shop is open throughout the week from 10:30 AM to 10:30 PM. Apart from selling new furniture, they also repair and refurbish old furniture.